Daruma, with no arms or legs, are modelled on an ancient Buddhist monk who, after nine years sitting meditating in a cave, lost the use of his arms and legs. 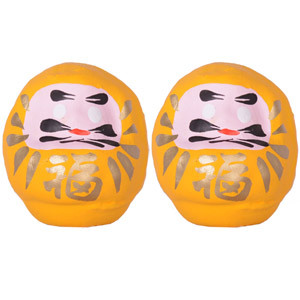 A daruma is thought to bring good luck. One eye is painted in when a person sets out on a task and then the other eye is painted in when his/her goal has been achieved.